Artist Music's student piano program gets your students pianos at a great value for less than other stores (guaranteed). * Digital pianos can be traded in (at purchase price) within 3 years. * Acoustic pianos can be traded in (at purchase price) within 10 years. 1. The Action: grand piano hammers sit horizontally, so gravity returns them to position more quickly. This makes grands much better at repeating notes. 2. The Sostenuto Pedal: the middle (sostenuto) pedal is not installed on most upright pianos (most upright manufacturers replace it with a mute pedal or half-sostenuto). That pedal allows the performer to sustain any note (or group of notes) and is useful in music by composers like Debussy and Rachmaninoff. Certain certificate exams test students on its use. 3. The Una Corda Pedal: the left pedal was originally designed to shift the action horizontally, so that the each hammer strikes fewer strings and/or strikes with a different area of the hammer. Not only does this help with soft playing, but it changes the tonal character of the piano, allowing for a much richer range of expression. Upright pianos are designed to move the hammers closer, rather than to the side. This makes it easier to play soft, but does not allow for any change in tonal character (since the area of the hammer hitting the string does not change). 4. Soundboard: grand piano soundboards project the sound up and out of the piano, whereas upright soundboards are enclosed and blocked off with much of the sound traveling behind the piano. The shape of a grand allows the player much more ability to hear expression and dynamics. 5. Exposed Strings: certain contemporary piano works require that the player reach in and pluck strings, or create new sounds with the objects placed on the strings. Pieces like this can be fun and exciting for the student, but it takes a grand piano to play them! The fact is that piano teachers not teaching on a grand piano are not teaching their students the whole piano. If you are a teacher without a grand, click below for more information on how we can help get you properly equipped. You Can Fit a Grand! I CAN'T FIT A GRAND! You may have to rearrange some furniture, but If You Can Fit an Upright, then YES, You Can Fit A Grand! 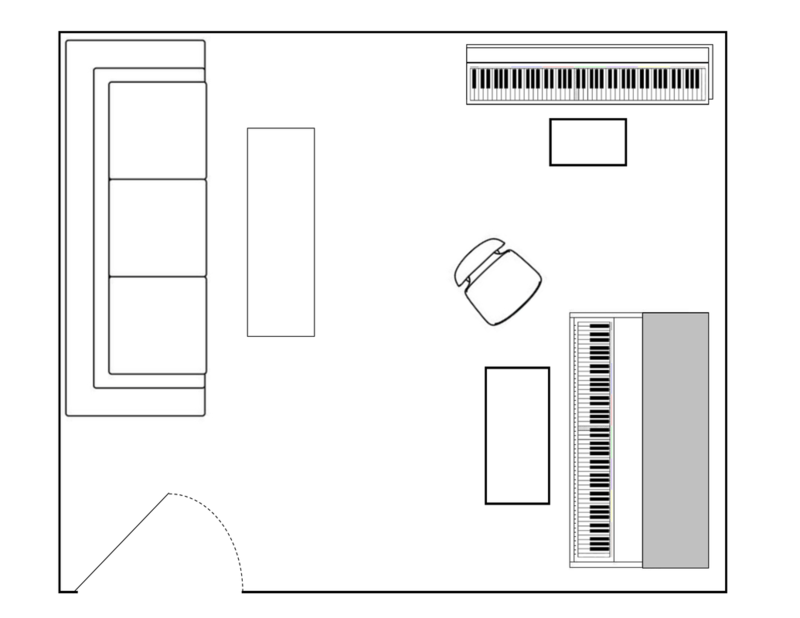 A small grand only takes a few more feet of space than an upright piano! I CAN'T AFFORD A GRAND! If you believe that, then You Haven't Been to the Right Piano Store! For most teachers, monthly payments on a grand piano purchased from Artist Music can be covered by monthly tuition fees collected from one or two students. And for those with true financial need, we have a financial assistance program. 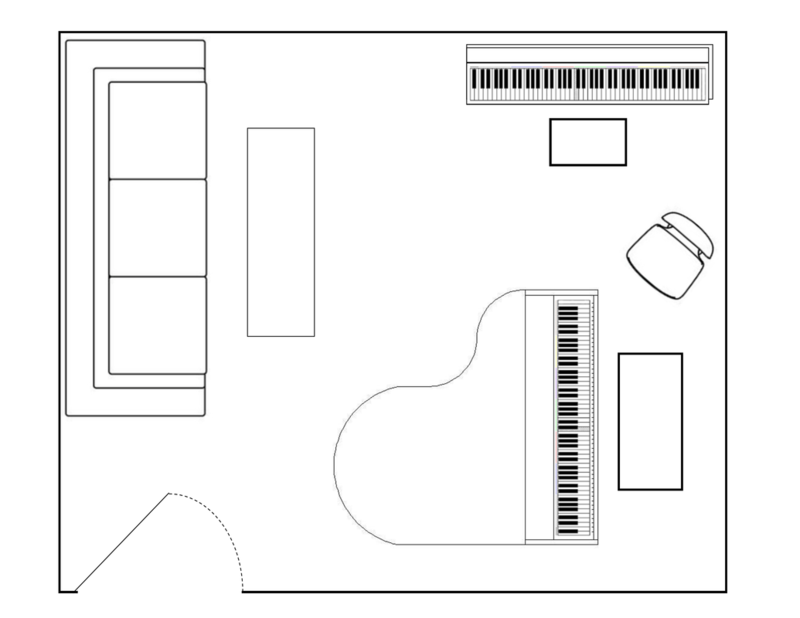 Set up your studio with a 5' Grand + a Digital Piano. For a limited time, teachers purchasing a new grand will receive a FREE Korg G1 Air Digital Piano (MSRP $2,000). Become an Artist Music Member for Complimentary Recital Space & More! In order to be considered, a site visit by an Artist Music representative may be required.